This article is about a man-made structure intended for human use or occupation. For the act of making buildings, see Construction. For structures not intended for human use, see Nonbuilding structure. For other uses, see Building (disambiguation). "Edifice" redirects here. For the brand of watches by Casio, see Casio Edifice. For technical reasons, "Building #19" redirects here. For the store chain, see Building 19. A building, or edifice, is a structure with a roof and walls standing more or less permanently in one place, such as a house or factory. Buildings come in a variety of sizes, shapes, and functions, and have been adapted throughout history for a wide number of factors, from building materials available, to weather conditions, land prices, ground conditions, specific uses, and aesthetic reasons. To better understand the term building compare the list of nonbuilding structures. Buildings serve several societal needs – primarily as shelter from weather, security, living space, privacy, to store belongings, and to comfortably live and work. A building as a shelter represents a physical division of the human habitat (a place of comfort and safety) and the outside (a place that at times may be harsh and harmful). Ever since the first cave paintings, buildings have also become objects or canvasses of much artistic expression. In recent years, interest in sustainable planning and building practices has also become an intentional part of the design process of many new buildings. The word building is both a noun and a verb: the structure itself and the act of making it. As a noun, a building is 'a structure that has a roof and walls and stands more or less permanently in one place'; "there was a three-storey building on the corner"; "it was an imposing edifice". In the broadest interpretation a fence or wall is a building. However, the word structure is used more broadly than building including natural and man-made formations and does not necessarily have walls. Structure is more likely to be used for a fence. Sturgis' Dictionary included that "[building] differs from architecture in excluding all idea of artistic treatment; and it differs from construction in the idea of excluding scientific or highly skilful treatment." As a verb, building is the act of construction. Structural height in technical usage is the height to the highest architectural detail on building from street-level. Depending on how they are classified, spires and masts may or may not be included in this height. Spires and masts used as antennas are not generally included. The definition of a low-rise vs. a high-rise building is a matter of debate, but generally three storeys or less is considered low-rise. A report by Shinichi Fujimura of a shelter built 500 000 years ago is doubtful since Fujimura was later found to have faked many of his findings. Supposed remains of huts found at the Terra Amata site in Nice purportedly dating from 200 000 to 400 000 years ago have also been called into question. (See Terra Amata.) There is clear evidence of homebuilding from around 18 000 BC. Buildings became common during the Neolithic (see Neolithic architecture). Single-family residential buildings are most often called houses or homes. Multi-family residential buildings containing more than one dwelling unit are called a duplex or an apartment building. A condominium is an apartment that the occupant owns rather than rents. Houses may also be built in pairs (semi-detached), in terraces where all but two of the houses have others either side; apartments may be built round courtyards or as rectangular blocks surrounded by a piece of ground of varying sizes. Houses which were built as a single dwelling may later be divided into apartments or bedsitters; they may also be converted to another use e.g. an office or a shop. Building types may range from huts to multimillion-dollar high-rise apartment blocks able to house thousands of people. Increasing settlement density in buildings (and smaller distances between buildings) is usually a response to high ground prices resulting from many people wanting to live close to work or similar attractors. Other common building materials are brick, concrete or combinations of either of these with stone. Residential buildings have different names for their use depending if they are seasonal include holiday cottage (vacation home) or timeshare; size such as a cottage or great house; value such as a shack or mansion; manner of construction such as a log home or mobile home; proximity to the ground such as earth sheltered house, stilt house, or tree house. Also if the residents are in need of special care such as a nursing home, orphanage or prison; or in group housing like barracks or dormitories. Historically many people lived in communal buildings called longhouses, smaller dwellings called pit-houses and houses combined with barns sometimes called housebarns. Buildings are defined to be substantial, permanent structures so other dwelling forms such as houseboats, yurts, and motorhomes are dwellings but not buildings. Sometimes a group of inter-related (and possibly inter-connected) builds are referred to as a complex – for example a housing complex, educational complex, hospital complex, etc. The principal design Engineering disciplines which would normally include the following professionals: Civil, Structural, Mechanical building services or HVAC (heating Ventilation and Air Conditioning) Electrical Building Services, Plumbing and drainage. Also other possible design Engineer specialists may be involved such as Fire (prevention), Acoustic, facade engineers, building physics, Telecomms, AV (Audio Visual), BMS (Building Management Systems) Automatic controls etc. These design Engineers also prepare construction documents which are issued to specialist contractors to obtain a price for the works and to follow for the installations. Facility managers who are responsible for operating the building. Regardless of their size or intended use, all buildings in the US must comply with zoning ordinances, building codes and other regulations such as fire codes, life safety codes and related standards. Vehicles—such as trailers, caravans, ships and passenger aircraft—are treated as "buildings" for life safety purposes. Any building requires a certain general amount of internal infrastructure to function, which includes such elements like heating / cooling, power and telecommunications, water and wastewater etc. Especially in commercial buildings (such as offices or factories), these can be extremely intricate systems taking up large amounts of space (sometimes located in separate areas or double floors / false ceilings) and constitute a big part of the regular maintenance required. 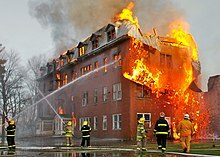 Buildings may be damaged during the construction of the building or during maintenance. There are several other reasons behind building damage like accidents such as storms, explosions, subsidence caused by mining, water withdrawal or poor foundations and landslides. Buildings also may suffer from fire damage and flooding in special circumstances. They may also become dilapidated through lack of proper maintenance or alteration work improperly carried out. ^ a b c Max J. Egenhofer (2002). Geographic Information Science: Second International Conference, GIScience 2002, Boulder, CO, USA, September 25–28, 2002. Proceedings. Springer Science & Business Media. p. 110. ISBN 978-3-540-44253-0. ^ Building def. 2. Whitney, William Dwight, and Benjamin E. Smith. The Century dictionary and cyclopedia. vol. 1. New York: Century Co., 1901. 712. Print. ^ Structure. def. 2. Merriam-Webster's dictionary of synonyms: a dictionary of discriminated synonyms with antonyms and analogous and contrasted words.. Springfield, Mass: Merriam-Webster, 1984. 787. Print. ^ Building. def 1. Sturgis, Russell. A dictionary of architecture and building: biographical, historical, and descriptive. vol. 1. New York: The Macmillan Co. ;, 1901. 2236. Print. ^ "World's oldest building discovered". BBC News. 2000-03-01. Archived from the original on 2009-02-15. Retrieved 2010-01-02. ^ Peter Hadfield (Nov 18, 2000). "Fraud means Japan must rewrite its history". New Scientist: 6. Archived from the original on 2014-11-29. ^ Peter Hadfield (Mar 4, 2000). "Gimme shelter". New Scientist: 4. Archived from the original on 2015-05-09. ^ Rob Dunn (Aug 23, 2014). "Meet the lodgers: Wildlife in the great indoors". New Scientist: 34–37. Archived from the original on 2014-11-29. ^ "plans to convert housing complex". Archived from the original on 2017-01-10. Retrieved 2017-02-23. ^ "isye building complex". Archived from the original on 2017-01-03. ^ "Building Damage". Pb.unimelb.edu.au. Archived from the original on 2014-02-14. Retrieved 2014-08-22. ^ Bru, G.; Herrera, G.; Tomás, R.; Duro, J.; Vega, R. De la; Mulas, J. (2013-02-01). "Control of deformation of buildings affected by subsidence using persistent scatterer interferometry". Structure and Infrastructure Engineering. 9 (2): 188–200. doi:10.1080/15732479.2010.519710. ISSN 1573-2479. ^ Soldato, Matteo Del; Bianchini, Silvia; Calcaterra, Domenico; Vita, Pantaleone De; Martire, Diego Di; Tomás, Roberto; Casagli, Nicola (2017-07-12). "A new approach for landslide-induced damage assessment". Geomatics, Natural Hazards and Risk. 0 (2): 1524–1537. doi:10.1080/19475705.2017.1347896. ISSN 1947-5705. ^ Brotóns, V.; Tomás, R.; Ivorra, S.; Alarcón, J. C. (2013-12-17). "Temperature influence on the physical and mechanical properties of a porous rock: San Julian's calcarenite". Engineering Geology. 167 (Supplement C): 117–127. doi:10.1016/j.enggeo.2013.10.012. Wikisource has the text of the 1911 Encyclopædia Britannica article Building.